SOUND FORGE Pro 13: Record. Edit. Master. Get it done. Record. Edit. Master. Get it done. 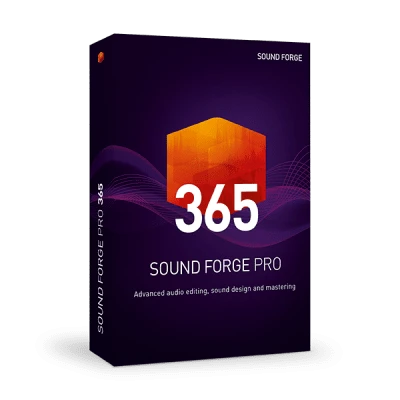 SOUND FORGE Pro has been an industry-standard audio editor for over two decades, and is used by many producers and sound engineers around the world because of its wide range of pro features. SOUND FORGE Pro 13 simply equates to recording, editing, restoration and mastering at the highest possible level. SOUND FORGE Pro 13 lets you record crystal-clear multichannel audio at sampling rates up to 64-bit/384 kHz, apply effects during capture, and monitor your recordings by way of a fully customizable interface. You can capture up to 32 audio channels and monitor everything in a customizable working environment, with simple file navigation and numerous recording workflow options. Start your recordings with a single click and stay on the main screen in your working environment. OTR saves you time and lets you focus on recording. SOUND FORGE Pro 13 supports DSD audio files for import, export, recording and mixing in PCM format. Export to DSD for mastering Super Audio CDs (SACD) and high-quality archiving. Use the recording dialog to set a threshold over which the recording is started by the input device, so you can record without being in both the control and recording room at the same time. Select the MIDI time code Trigger if you want to initiate playback or recording by receiving MIDI timecode from another device, like MIDI notes and controller values. Configure your recordings to start automatically from multiple selected input devices via a timer. The automatic settings will then also determine when to stop recording. Add plug-in effects to your source signal to create a more appealing headphone mix for the musician. Use this method to create your effects chain before recording and edit it with ease while working on your project. The waveform overview bar aids navigation over long recordings as it gives you a better feel for where you are in the audio file. Quickly switch between different projects and move your editing position with a single click. 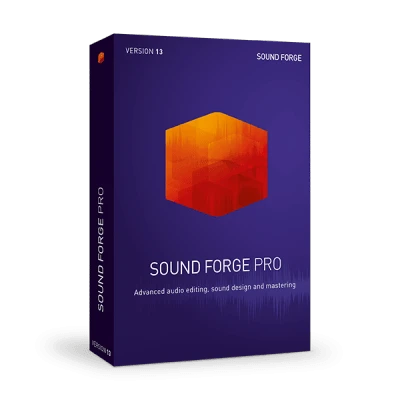 In addition to audio file processing, one of the core strengths of SOUND FORGE Pro 13 is its sound design functionality. Use a range of editing tools to precisely shape your sounds. The edit tool allows you to select audio files that you want to process or move about within a project. It also lets you edit simple envelope points within the audio file. Use the Event tool to edit multiple audio events in a data window. It's a simple way to clean edges and crossfades, and makes it easier to create tracks for Disc-at-once CDs. With the pencil tool, you can edit the waveform by drawing on it. For example, you can zoom in on the problem area and redraw the waveform if there is an interfering blip in the audio file. Use this tool to zoom in on a region. Drag the mouse pointer over an area to zoom in on it. Your edited selection will also be retained when you release the mouse button. Use the Envelope tool to add, remove or adjust envelope points. You also use the Envelope tool if you want to add, remove or adjust points on effect automation envelopes. Get impressive time stretching and pitch shifting without artifacts, thanks to the new élastiquePro v3 engine. Based on modern psychoacoustic models and signal processing theory, zplane élastique delivers stable timing, cross-channel phase coherence and sample-accurate stretching without sound degradation. The user interface in SOUND FORGE Pro 13 is fully configurable. Waveform and envelope colors, markers and preset window heights can be adjusted to your preference and workflow. Create and save multiple interface layout configurations and utilise a single or dual monitor setup. SOUND FORGE Pro 13's new user interface can now be adapted to your lighting environment and is available in four different colour tones: White, Light, Medium or Dark. Adjust the user interface for maximum comfort when working with audio. Get the complete picture. Newly designed icons make it easier to find various functions in SOUND FORGE Pro 13. In an instant, you'll know where to click to start a recording, cut audio files or save projects. The window structure is now completely tailored to your needs for various functions and audio processing tasks. From recording to mastering, there are presets for all the functions you need in every application. SOUND FORGE Pro 13 can open, edit, convert and save different types of audio files from various sources, all within a multitrack environment and with surgical precision. You can edit a new file while SOUND FORGE Pro 13 processes and renders another file in the background – a real time saver. Easily create loops for ACID and edit the properties of WAV files. This information is embedded in the file and can be customized in ACID at any time. Change the number of channels in an audio file, rotate the channels in a stereo file, or mix the channels of a multichannel file to create different panning scenarios. High-quality plug-ins. Excellent sound quality. SOUND FORGE Pro 13 contains numerous effects and plug-ins for mastering and cleaning audio files. These are based on high-quality DSP algorithms, which offer the highest precision in post production. Digital signal processor effects allow you to edit audio files in real time and perform incredibly complex mastering tasks. Give your sound more natural dynamics, more stereo space and clean up background noise. Compared to a classic compressor, a 2-Point compressor has two kink points. This allows you to create different characteristics and offers more freedom when compressing dynamic range. The limiter sets the maximum value of the processed audio signal level, which then won't be exceeded. Volume differences are eliminated, so that loud and quiet sections are levelled out. Suppress noise and increase your range, as the dynamics of the audio signal are increased for a more natural sound. Compress the dynamic range of an audio signal and eliminate volume differences between soft and loud passages. The gate is used to suppress quiet sections in the signal transmission. This removes noise and produces a clean sound. Wave Hammer 2.0 is a combination of a classic compressor and a volume maximizer that makes it the perfect mastering tool. With Wave Hammer 2.0, you can make your tracks audibly louder and have more control than with standard peak normalization. iZotope Ozone Elements includes a variety of presets and macro controls to produce your desired master with ease. The Mastering Wizard analyzes your mix, creates a sound profile and suggests presets, signal chains and processor settings. Customize the sound to your taste so you can quickly create different masters for everything from radio broadcast to web streaming. Over 75 professionally-designed presets for different genres, formats and more. Full support for VST, AU, RTAS, AAX and ARA2 plug-ins. Simple controls provide a better workflow to create impressive masters, effortlessly. The perfect application to deliver both radio and streaming masters. Create echoes with the Delay. The simple delay effect is based on analog circuits and produces time-delayed copies of the original input signal to create the echo effect. For a fuller sound, Chorus produces a time-delayed duplicate of the audio signal with a slight pitch difference. A perceptible doubling and beating effect is created. The Flanger creates a dynamic, colder sound. By superimposing the original signal and its time-delayed copies, sweeping effects are created for the classic 'wandering' sound. Advanced reverb technology integrates the acoustic properties of a specific environment or location into your audio file. With this technology, you can also simulate the signal behavior of vintage audio devices. The DeHisser eliminates uniform white noise typically generated by microphones, preamps or transformers. Unlike noise reduction, no distortion selection is required. DeClicker removes individual clicks and pops that are present in audio files, typically from old vinyl recordings. DeCrackler is designed to remove continuous and low noise from your files. DeClipper repairs clipping artifacts that occur when A/D converters are pushed too hard or the tape is over saturated. It's useful for concerts or interviews that can't be re-recorded. iZotope RX Elements includes a standalone audio editor and real-time plug-ins to fix the most common errors in typical recordings, such as clipping, humming, clicking and other unwanted background noise. iZotope RX 7 Elements is indispensable for anyone who wants to create perfect audio productions. Restore digital and analog clipping artifacts to restore distorted audio files. Reduce unwanted noise such as air conditioning, fridge hum and amplifier noise. Easily remove line noise and ground-loop hums. Eliminate low-latency vinyl clicks and crackle, and soften the clicking on bass guitars. SOUND FORGE Pro's VST2/3 engine has been further developed to offer greater stability and speed when scanning and using plug-ins. The dialog between the VST host and the effect plug-ins is now more efficient, allowing you to work faster and more accurately. The ARA2 interface extension makes the exchange of information between SOUND FORGE Pro and the plug-ins even more extensive, increasing the overall flexibility. This allows more efficient use of plug-in audio data and real-time editing to be performed. SOUND FORGE Pro contains POW-r dithering. This consists of a set of three dithering and noise shaping algorithms, each tailored to a specific type of audio recording: spoken word, music with a limited dynamic range, and music with a large dynamic range. Type 1 has the flattest frequency spectrum in the audible frequency range, and is ideal for less stereophonically complex material such as solo instruments and vocals. Type 2 has a psychoacoustically optimized low-order noise shaping curve, and is recommended for audio material with higher stereophonic complexity. Type 3 has a psychoacoustically optimized high-order noise shaping curve, and is recommended to be used in full-spectrum stereo field audio material. Export using Disc Description Protocol Master and be ready to press your CDs. DDP masters are resistant to generational loss due to duplication and can be easily archived. The digital data is provided with a checksum and passed on to the pressing plant to ensure error-free reproduction of audio CDs. Disc-at-once CD burning is used when creating a master disc to be sent to a CD manufacturer for mass duplication. Multiple audio tracks are written to the disc. You can also add track markers to a single recording of a live set and burn a complete Redbook standard audio CD. SOUND FORGE Pro 13 lets you analyze your sounds with high-quality audio visualization tools. Based on audio data, your music, speech or sounds are displayed graphically and dynamically. Now you can measure peak levels of your audio signal reliably and correctly. The Peak Meter V2 shows you the precise, current level of an audio signal. The 'sensAI SINGING VAD' from audEERING is a modern tool which uses artificial intelligence technology to detect lead vocals and choruses in music, marking any passages containing vocal lines. This provides you with a quick overview of complex mixing projects. The Phase Scope helps you to find the phase cancellation between the channels in the audio file. Thanks to the Correlation Level Meter, you can detect and eliminate mono-compatibility limitations between channels. CALM-standard metering allows high-precision volume measurement, and gives you a clear visual indication of the dynamic range of your audio signal. The Commercial Advertisement Loudness Mitigation Act (CALM) regulates the overall volume during commercial breaks. The multi-channel capable spectral analysis shows several graphs that detail the fundamental frequencies and harmonics in your recordings. Monitor audio and effect changes and take multiple snapshots – then use the overlay views to compare and adjust frequencies. Clipped peak detection and marking automatically scans audio files and marks any clipping. This allows you to see all clipping points at a glance, and remove them with the DeClipper included in SOUND FORGE Pro 13. Scripting is a welcome addition to automate repetitive tasks and implement individual functions. SOUND FORGE Pro 13 contains a number of scripts that you can use or modify. These include the Mastering Wizard and Cleaning Wizard. Customise these however you like: you can use the script editor to open, create, edit and execute scripts or write your own scripts in C#, JScript or VBScript. The Batch Converter lets you apply the same effects and processes to multiple files, saving hours of editing and conversion time. You simply add a group of files to the Batch Converter interface, select an effect or process, and run the script. You can also save and easily recall your most frequently-used batch scripts for a faster workflow. Mastering Wizard enables quick and easy masters of your audio to be created to give them a professional edge. The software guides you through a typical mastering process and the different effects used each time. It even includes different presets that you can try out, or simply use your own settings to change levels, compress or EQ for perfect results. Cleaning Wizard is an indispensable tool to help you remove noise and other artefacts from your audio. It guides you through a typical cleaning process and the tools used, so that you can quickly and easily reduce hum, pops and crackles. It is a one-stop utility for cleaner audio and an ideal tool to help you get pristine-quality audio. essentialFX Suite offers a great set of 11 high-quality plug-ins that cover all of your music production processing needs. Thanks to high-quality algorithms, clear controls and an easy workflow, pro audio results can be achieved with just a few clicks. A flexible effect similar to a classic analog gate with soft knee and sidechain filter function for fast and accurate ducking. A channel strip with compressor, deEsser, gate, highpass filter and tone shaping in one special tool which is ideal for speech or vocal tracks. A classic compressor with a comparatively soft curve and an adaptable regulation process, it compresses completely musically. A tremolo effect with rate, shape, tremolo and panorama for rhythmic stereo effects with auto panning textures for synths or vintage guitars. A traditional chorus/flanger effect with rate, depth, feedback and mix settings giving sounds more space by modulating or delaying the pitch. A dynamic filter which constantly input signal peaks high above average frequency ranges for reducing unwanted sibilance in speech and vocals. A classic phaser effect with adjustable rate, depth, feedback and mix settings for enduring signals like synth washes to create atmosphere. An authentic analog tube amplifier simulation with an oversampling mode to get a compact and more vivid sound picture with more dynamics. A dynamic tool for increasing the loudness of the audio signal and to limit the level of a signal to a certain threshold to safeguard against clipping. A completely algorithmic reverb for creating versatile reverb effects to produce thick and transparent reverberation for all kinds of signals. A stereo delay with individually adjustable settings for both channels, as well as tempo sync which can add stereo width to vocals or instruments. An analogue compressor, transient designer, band simulator and tube amp in one suite. Analogue Modelling Suite contains a collection of four plug-ins based on replicas of classic circuit designs, and offers classic analogue sounds for a digital world.